While manufacturing has seen a revival, the financial services has witnessed the maximum jump among the major sectors and the FDI in the sector rose 200 per cent from $1.02 billion in FY14 to $3.07 billion in FY15. Bucking a three-year declining trend, the manufacturing sector in India witnessed a sharp jump of 50 per cent in foreign direct investment (FDI) in the year 2014-15, thereby reflecting the traction received by the government’s ‘Make in India’ initiative. According to data released by the Reserve Bank of India (RBI) in its annual report for the financial year 2014-15, the aggregate FDI received in rose 54 per cent to $24.7 billion from $16 billion in the previous year ended March 2014. This is also the highest FDI received in at least five years. The data relates to FDI received through Foreign Investment Promotion Board (FIPB) and RBI routes only. The manufacturing sector continued to be the largest beneficiary and accounted for 38 per cent of the total FDI received and rose to $9.6 billion. Interestingly, it is the first time in 3 years that FDI in manufacturing has witnessed an expansion. While it stood at $9.3 billion in 2011-12, it declined in the following two years to $6.5 billion and $6.3 billion in FY13 and FY14, respectively. However, as a result of the government’s push on manufacturing in India and ease of doing business initiative, the FDI in manufacturing has witnessed a boost. The other major gainer was the computer services industry which saw FDI rise by1 30 per cent from $934 million to $2.15 billion in the same period. Even the retail and wholesale trade segment saw a 124 per cent rise in FDI from $1.1 billion to $2.55 billion. financial year 2012-13 amounting to over $8 billion, it declined sharply in the year 2013-14 to 3.7 billion. 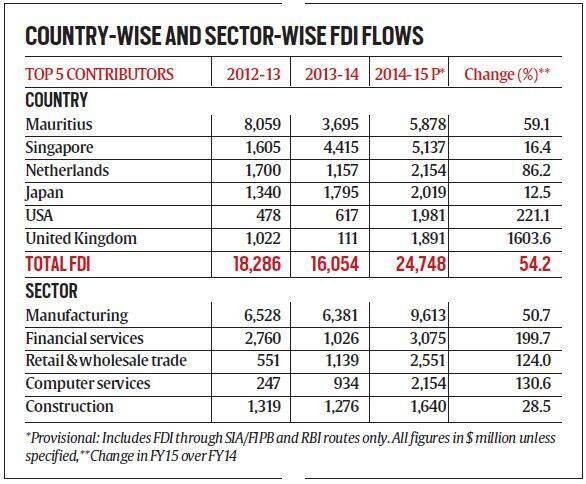 In FY14 Singapore accounted for FDI flow worth $4.4 billion to India and thereby overtook Mauritius. But in FY15, the FDI from Mauritius jumped 60 per cent and stood at $5.87 billion. That from Singapore stood at 5.1 billion for the year ended March 2015. FDI from UK has jumped from $111 million in FY14 to 1.89 billion in FY15. FDI from US also rose 221 per cent to $1.98 billion. Investment experts say that FDI from Mauritius had declined on account of the fears related to General Anti-Avoidance Rule (GAAR) and a decision to defer it by two years has improved the investment sentiment. GAAR ,that was considered controversial as it sought to seek taxes on a retrospective basis was introduced by the then finance minister Pranab Mukherjee in 2012. However, in his budget speech in 2015 the finance minister Arun Jaitley announced to defer its implementation by two years.